Thirty years ago this spring the two best college basketball teams in Texas were Sam Houston State and Stephen F. Austin, separated by a few miles of country roads and East Texas pine forests and light years of animosity. This year the Bearkats and Lumberjacks both have outstanding teams again. When they meet Feb. 22 in "showdown 2003" for a possible Southland Conference regular season championship, a number of the members of that great SHSU team of the 70s are expected to be on hand. Several activities are being planned during the day by the SHSU Alumni Association, highlighted by a reception for team members and fans. That event will be held in Johnson Coliseum after the SHSU and SFA women's game, which begins at 4 p.m., and prior to the men's game at 7. Other activities include free hot dogs from 11 a.m. to 2 p.m. at the Bearkat Softball Complex, where the softball team meets Stephen F. Austin in games scheduled for 1 and 3 p.m. The Bearkat basketball team of the spring of 1973 ran off one of the longest one-season win streaks in National Association of Intercollegiate Athletics (NAIA) history--28. Going back to the previous year, the team won a total of 34 straight. The 1973 season ended with the Bearkats being named college division national champions by both the Associated Press and United Press International, rankings which included both NAIA and NCAA college division teams. The scene for this year's matchup will be different from that 30 years ago, to be sure. Then the Bearkats played in the Men's Gym, which could pack in maybe 2,000 including standing room only in the recesses around the court's edges. Now the team plays in Johnson Coliseum, built in 1976 and capable of seating more than 6,000. No crowd has approached that number this year, even with the athletic department's 25 cent jumbo hot dog night promotion, but a large contingent of SFA fans expected for the Feb. 22 game may help set the 2003 attendance mark to date. Thirty years ago the Bearkats won both games against SFA, by 15 and 14 points. This year the Lumberjacks won in overtime in Nacogdoches, and a week prior to the game, the teams were in a virtual tie for first place. A playoff among the top teams will determine the conference NCAA tournament representative, so there is a good chance that the Kats and Jacks will have three "showdowns" this year. The 1973 Sam team was heavy with seniors, as is this year's, but there is no one on the current group who approaches the individual stature of James Lister, who still holds many of the Bearkat team scoring and rebound records. The 6-10 Lister was a three-time all-America selection and first team all-Lone Star Conference four years, twice being named the conference most valuable player. He left with conference career records for most points, most field goals, and most rebounds. Lister averaged 21.7 points and 15.8 rebounds per game. Of the top 40 Bearkat scoring efforts of all time, Lister owns 23, with points per game highs of 47, 45 and 44. 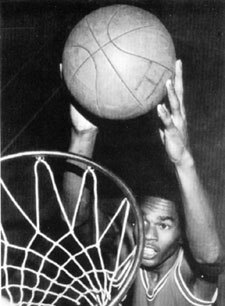 His 30 rebounds in the 1972 SFA game set a conference record. Another outstanding player, who had a knack for stepping up his game when the others were having a rare off night, was 6-8 Robert White, who averaged 15.5 and 11.3 rebounds in his career. He was all-conference three years and all-America honorable mention as a senior. Randy White, who was a statistician for the '73 team, and is helping organize the event, said he expects White, Lister, and many other team members to attend.